From Good Smile Company. 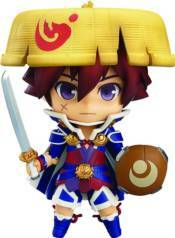 From the popular game Shiren the Wanderer 5+ Fortune Tower to Unmei no Dice comes a Nendoroid of the main character, Shiren! He comes with both a cute yet courageous standard expression as well as a cheerful smiling expression. Various optional parts are also included to help him get through the dungeons - his standard sword and shield, as well a stave, scroll and riceball plus his faithful partner 'Koppa,' Enjoy posing Shiren and Koppa trying their best to get through the dungeon!